CCMR continues to strengthen its efforts to reach underserved youth through our growing relationship with the Ithaca Youth Bureau (IYB). Located in Ithaca, New York, the Youth Bureau serves primarily African-American and low socioeconomic children in the Ithaca area. CCMR began its involvement with the Youth Bureau in the summer of 2004. Since then, our ongoing collaborations have been growing to include several of the Youth Bureau’s programs with hopefully more to come. IYB Summer Camp: Working with the IYB program staff, CCMR brings students in the IYB summer camp onto the Cornell campus to participate in various science activities. Previous presenters for this program have included Professors Geoff Coates (Chemistry & Chemical Biology), Dotse Sogah (Chemistry & Chemical Biology), Erich Mueller (Physics), and Lara Estroff (Materials Science & Engineering). Prof. Coates led the students through a simple titration to determine the vitamin C content in a range of juice drinks. Prof. Sogah and his research group taught the students about polymers and even helped them make their own silly putty. Prof. Mueller helped the students to learn about projectile motion, by having them build and test catapults. Prof. Estroff did simple chemistry activities with the students such as making ink and glue. 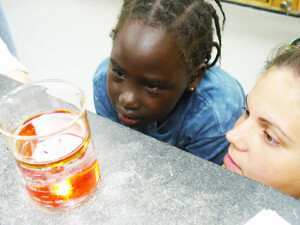 After School Programs: CCMR provides monthly after school science programs for the students at the bureau. The first of these programs, held in March 2005, was led by Post-doctoral Fellow Catherine Oertel on the science of music. Big Brothers/Big Sisters: In February 2005, CCMR began monthly Saturday afternoon programs with the Big Brother/Big Sister program at the Bureau. Presenters for this program have included Professor Lynden Archer (Chemical & Biomolecular Engineering) and his research group, who presented modules based on polymers, mixing solutions and surface tension to the children and their mentors, and Professor Juan Hinestroza (Fiber Science & Apparel Design) and his research group who presented a module on density and buoyancy.